Nancy Miller handcrafts her uniquely textured wearable art jewelry designs in her streamside Saratoga Springs studio near the foothills of the Adirondack Mountains of upstate New York. She has been making jewelry since 1993. 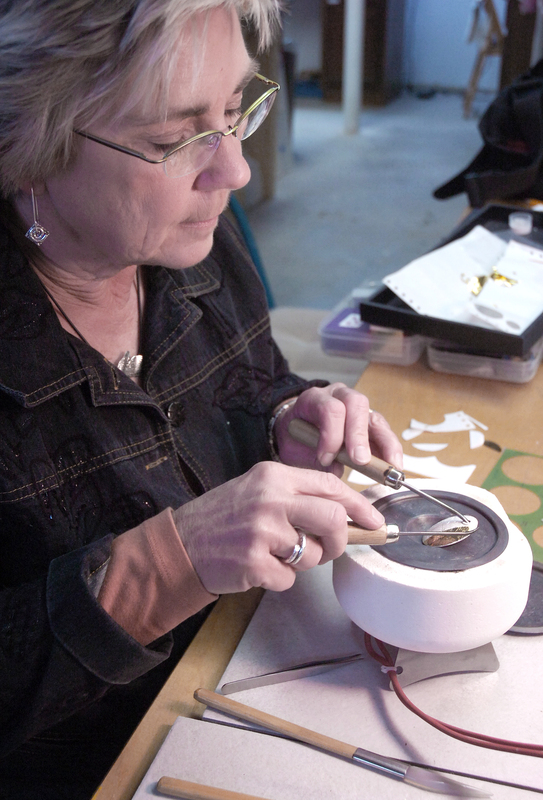 After completing a series of jewelry fabrication classes then continued her education through workshops. 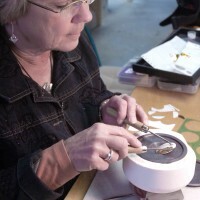 Building on her background in traditional jewelry fabrication techniques, she has enjoyed experimenting with a wide variety of metal clay techniques since 2001. She takes advantage of the unique characteristics of metal clay which accepts textures readily, forms fluid curves and invites spontaneity during the design and construction processes. Metal clay consists of small particles of metal combined with an organic binder and water to produce a clay-like substance. After texturing, shaping, drying and refining, each piece is kiln fired to produce a purely metal object which is then finished by traditional jewelry making methods. Each piece is individually crafted by the artist’s hands. Nancy’s designs reflect influences from nature, commonplace objects, different cultures, historical references and a sense of humor. She works with sterling and fine silver, high Karat gold, bronze, copper, titanium, concrete, polymer clay, gemstones, and pearls in her pieces which are often accented with rich patinas. Nancy seeks to create versatile yet uncommon jewelry that will complement the personal style of the wearer and become favorite pieces that are worn often. In 2004 Nancy developed and coordinates an entirely volunteer run summer time jewelry program for seriously ill children at the Double H Hole in the Woods Ranch, one of the camps founded by Paul Newman. She also frequently teaches classes at her Saratoga Springs studio and other locations. To read more about summer PMC jewelry making with the campers at Double H Ranch in Lake Luzerne, NY check out this post on Rio Grande’s blog.